The 10 piece. CRIMSON G10 Cutlery Block Set is crafted from high carbon German steel with special ground precision sharp edges for light work of any kitchen prep task. The handles are made with the world's strongest G10 (Fiberglass Resin Material) in a reddish brown wood grain look & no maintenance needed. The polished blades are stain resistant for easy to cleaning and maintenance. Enjoy the beauty of these fine precision cutting blades in your kitchen and discover the quality, passion and ergonomics behind Ergo Chef. Family owned and operated since 2002. 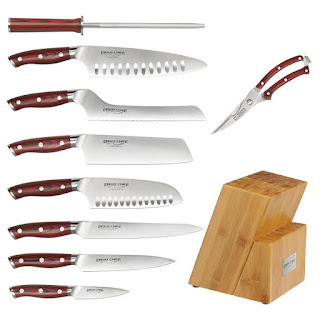 Includes: 8" Chef knife w/ hollow ground ovals in blade, 8" Carver, 8" Offset Serrated Bread knife, 7" Nakiri, 6" Santoku w/ Hollow ground ovals in blade, 6" Utility knife, 3.5" Paring knife, 8" Honing Rod for keeping your edges straight, and heavy duty Poultry shears. 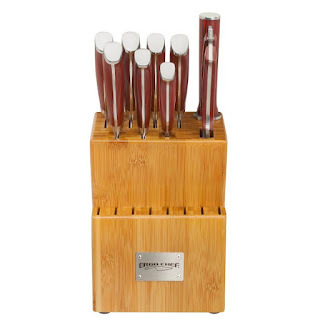 Knife Block: 17 Slot Bamboo finished in it's natural color with 4 rubber pad feet for non-slip counter placement. USE TIPS: Always use Wood, Bamboo or Plastic cutting boards with the knives - NEVER USE GLASS, CORIAN, STEEL or HARD COUNTER TOPS when cutting food as this will dull the knives & damage the edge. Always hand wash the knives with a soft sponge after each use and dry with a towel then store back in block. If blades become stained or get water spots you can clean them easily with Comet Cleanser or Bar Keepers Friend. Professionally Sharpen the knives every 1-2 years depending on use and edge condition - You can use our sharpening service to get that like new edge back on the blades. Click here to visit the Ergo Chef Website to see there entire line at terrific prices. Also, make sure you follow and like them on the entry form to show your appreciation for this giveaway.